The best piece of advice I ever received at the beginning of my homeschooling journey was to decide my philosophy of education before buying a single curriculum item. That has proven to be incredibly helpful (and money saving like you wouldn’t believe) because there is a veritable smorgasbord of curriculum out there. If you can knock some off the list, you help yourself in the decision making. I shared this wisdom in my post The Best Advice I was Given as well as in my series 10 Steps in Choosing a Homeschool Curriculum (it was #1 on the list). I realize, though, that I haven’t explained the basic philosophies of education. Today, I want to introduce the subjects by giving basic definitions. They provide jumping off places for you. Philosophy of education decides what and how students are taught. They represent “answers to questions about the purpose of schooling, a teacher’s role, and what should be taught and by what methods.”* They are important and they affect what curriculum you will choose and use. As you read each of these, think about how this philosophy would play out in a classroom or homeschool. Essentialism: focuses on teaching the essential elements of academic and moral knowledge. Essentialists believe in a strong core curriculum and high academic standards. “They believe that education, like human nature, is constant. Education is preparation for life.”** Teacher centered. Perennialism: focuses on the universal truths that have withstood the test of time. Perennialists urge that students read the Great Books and develop their understanding of the philosophical concepts that underlie human knowledge. Teacher centered. Progressivism: based largely on the belief that lessons must be relevant to the students in order for them to learn. 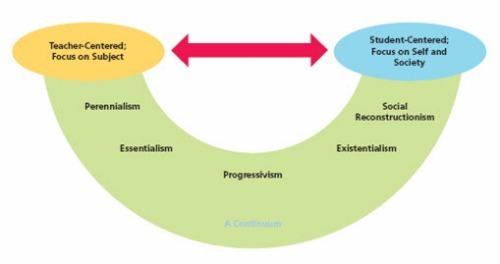 The curriculum of a progressivist school is built around the personal experiences, interests, and needs of the students. Student centered. Social reconstructionism: separated from progressivism because they desired more direct and immediate attention to societal ills. They are interested in combining study and social action, and believe that education can and should go hand in hand with ameliorating social problems. Student centered. Realism: focuses on teaching about the world, specifically the physical world. Truth is based on observation. Classrooms are highly ordered and disciplined, like nature, and the students would be passive participants in the study of things. Teacher centered. ** While realism isn’t on this image, can you see where it would fit? Sometimes, we change philosophies. This can be due to how we view child development or a variety of reasons. We don’t have to pick one and sign up for life. I know that these sound like lofty ideas that don’t affect anything, but that’s not true. While it might be true that you sound like a real brainiac if you use these terms, sorta making them lofty-ish, they actually are quite practical in terms of educational choices. How do these matter in your homeschool? 1. If you choose a method that doesn’t match your philosophy, then you will likely feel that you aren’t addressing issues or that something is missing. You’ll notice something being “off”, but you might not be able to tell why. 2. You will probably not enjoy homeschooling if your curriculum doesn’t line up with your philosophy. The two need to connect for you to like how things are going. 3. Another issue that can be caused by having conflicting educational philosophies and curriculum is that you could actually encourage a mindset that clashes with your worldview, without even realizing it. Shooting yourself in the proverbial foot. Think of educational philosophies as the same as philosophies of corporate church worship or child raising: the philosophy affects the methods the church leaders use to organize, plan, and carry out the activities that occur on Sunday morning and/or the methods use to discipline and train a child. So, if you are considering homeschooling or you are unhappy with your homeschool, take a bit of time to think about these. Even if you can’t name them in a few weeks. Or days. Next, we will talk about methods of education. They are tied to philosophies (which you probably hadn’t heard of until today…. and I didn’t actually remember until I researched for this post… so we both learned something today) and methods are talked about in all homeschooling circles a lot (this means you will hear about them at support groups, conferences, and even park days or you possibly already have). I will try my darndest to make sure you know the philosophy behind the method and curriculum. They will overlap a bit. The methods are where the rubber meets the road. Have you heard of these philosophies of education? Do you already know which one(s) you prefer? Which one(s) do you think the schools you attended growing up adhered to for the most part? What points most stand out to you about philosophies of education? MOVE ON TO Methods of Education here!